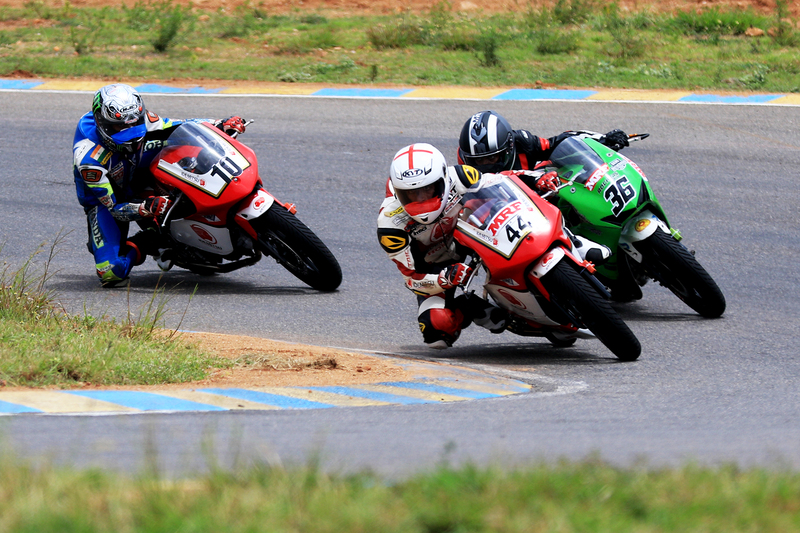 Coimbatore, June 10: Chennai youngster KY Ahamed (TVS Racing) and Anish Damodar Shetty (Honda Ten10 Racing) from Hubballi, Karnataka, scored a double apiece in their respective classes on Sunday as the Rolon Round of the MRF MMSC fmsci Indian National Motorcycle Racing Championship 2018 concluded at the Kari Motor Speedway here. Ahamed, the 20-year old who made his debut in this class in 2015, rode another fine race to notch his maiden double even as reigning National champion and team-mate Jagan Kumar, who had finished second in the first race of the double-header yesterday, crashed following a front tyre deflation on the 10th lap and limped home sixth despite clocking the fastest lap of the race. Finishing second behind Ahamed was team-mate Deepak Ravikumar as TVS Racing completed their second 1-2 finish of the weekend. Honda Ten10 Racing’s Mathana Kumar was a disappointing third after leading in the opening two laps before dropping down to third as Ahamed and Jagan overtook him. After Jagan crashed, Mathana had a moment with a backmarker and saw Ravikumar move past him in the closing stages of the 15-lap race. “I am very happy with the double. It was a tough race, but I managed to hang on to my first place, especially after Jagan crashed,” said Ahamed. Emulating Ahamed was 23-year old Bengaluru-based techie Anish Shetty in the Pro-Stock 165cc class who had to work hard for his victory as through the 15 laps, he was hotly chased by Kevin Kannan (Rockers Racing) and Mithun Kumar (Honda Ten10 Racing). The trio finished in that order after an entertaining battle. 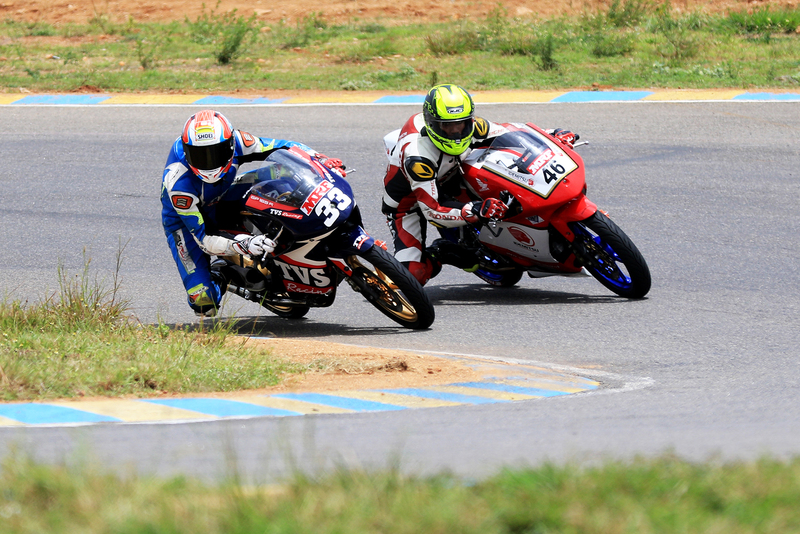 Sparks Racing had a profitable outing in the Novice (Stock 165cc) class as Aditya Rao and Karthik Mateti delivered the team a 1-2 finish from a 32-rider grid that was arrived at after two heats. Akshay Murali (Apex Racing) completed the podium. There was more cheer for Sparks Racing as Ann Jennifer won the National championship girls race ahead of Nivetha Kumar (First 1 Racing) and Czimkhy RV from Trivandrum. The girls did well to hold their never as the eight-lap race was run in spells of sharp showers. NATIONAL CHAMPIONSHIP – Super Sport Indian 165cc (Race 2,15 laps): 1. KY Ahamed (TVS Racing) (18mins, 23.078secs); 2. Deepak Ravikumar (TVS Racing) (18:23.550); 3. Mathana Kumar (Honda Ten10 Racing) (18:24.464). Pro-Stock 165cc (Race 2, 15 laps): 1. Anish Shetty (Honda Ten10 Racing) (19:28.918); 2. Kevin Kannan (Rockers Racing) (19:29.420); 3. Mithun Kumar (Honda Ten10 Racing) (19:31.426). Pro-Stock 301-400cc (Race 2, 15 laps): 1. Amarnath Menon (Gusto Racing) (18:22.762); 2. Satyanarayana Raju (Gusto Racing) (18:25.077); 3. Antony Peter (Vortex Racing) (18:39.130). Novice (Stock 165cc, 10 laps): 1. Aditya Rao (Sparks Racing) (13:28.042); 2. Karthik Mateti (Sparks Racing) (13:28.457); 3. Akshay V Murali (Apex Racing Academy) (13:37.568). Girls (Stock 165cc, 8 laps): 1. Ann Jennifer (Sparks Racing) (11:55.766); 2. Nivetha Kumar (First 1 Racing) (12:01.280); 3. Czimkhy RV (Pvt) (12:11.675). One-Make Championship: Idemitsu Honda India Talent Cup 2018 organised by MMSC – Race 2 (CBR 250, 15 laps): 1. Senthil Kumar (19:40.847); 2. Anish Damodara Shetty (Hubballi) (19:40.950); 3. Abhishek Vasudev (Bengaluru) (19:41.128). TVS – Open (Apache RR 310 R2) 10 laps: 1. Yashas RL (Bengaluru) (13:16.475); 2. Vivek Pillai (Chennai) (13:20.907); 3. Peddu Sriharsha (Hyderabad) (13:21.068). Race 2 (15 laps): 1. Deepak Ravikumar (Chennai) (19:30.812); 2. S Sivanesan (Chennai) (19:40.844); 3. Peddu Sriharsha (Hyderabad) (19:47.759). Novice (Apache RTR 200) Race 2 (10 laps): 1. Karthik Mateti (Hyderabad) (14:10.019); 2. Anand R (Chennai) (14:25.680); 3. AS Alexander (Chennai) (14:32.877).